Chris Paine, best known as the director of Who Killed the Electric Car?, followed the rise and fall of General Motors EV-1, of which he was a passionate owner. He recently completed a new film, Revenge of the Electric Car, now going into theatrical release. It opens on Friday, November 4th at the Kendall Square Cinema in Cambridge. (Visit the List of Screenings for for screening dates around the country). I recently had a conversation with Chris about his new film, here’s what we talked about. David Tames: What was the impact of Who Killed the Electric Car? from your perspective? Chris Paine: The film told the story of what happened to about 5,000 electric cars out in California that most people had never heard about. That motivated a lot of people (including me) to keep the pressure up for change and that in turn motivated a lot more people both inside and outside industry. Tames: How did Revenge of the Electric Car evolve? Paine: We started hearing rumors that the car industry was rethinking its decision to quash electric cars. High gas prices in 2008, national security pushback around oil dependence, and people fed up with gas car impact also played a role. We had some connections so we decided to go inside the system and see how things can — sometimes — change from the inside out. Tames: What’s different this time around as far as electric cars go? Paine: Most people understand that oil is finite and putting it in cars is not smart when you can use electricity and get a better result. Technology costs have come down and a lot more people know about them. You also have some incredible people leading the charge. Tames: How did you decide to focus on the people you did end up focusing on in this film? Paine: We started with about seven folks and over three years, narrowed our focus to four of the most fascinating who we were able to stay in touch with. Tames: Were there some people you spoke with that did not make it into the film? Paine: Hundreds. You meet so many interesting people of all kinds in the course of a long form documentary and eventually you have to decide how many your audience is going to be able to track in 90 minutes. Better known people include Shai Agassi who we tracked in Israel, Dave Barthmus, GM’s corporate spokesman in first film, Simon Peres, Rainn Wilson, the President of Iceland, a couple getting married on electric bikes and on and on…. Tames: Are there some people you wanted to talk with who would not talk with you about their work? Paine: Plenty. We approached many car companies at first and few would take the risk of letting our crew in. Tames: What are you driving right now? How do you like it? Paine: I traded in my Prius and bought a Chevy Volt, for full price I might add. Got to know the car over its development and it won me over. 40 miles electric then turns into a 38 mpg car for longer trips. My girlfriend drives a Leaf and that’s pretty great too. And of course, I still have the very early edition Tesla I bought after finishing the first film. Tames: What do you hope viewers will take away with them? Paine: I hope they take the time to test drive or if they can afford it, buy one of these new generation plug-in cars. What got me going on this originally was how emotionally thrilling it was accelerating in all electric mode. If the film inspires that, I’ll be happy. It really makes for a better future if we continue to use cars. Tames: What was the most challenging moment while making the film? Tames: Are there filmmakers or other artists you draw inspiration from? Paine: Everyone I work with – my co-writer Peter, my producer Jessie, my editor Chris, our composer David, and on and on. I get the credit for a big team effort. Outside of our crew, I really like the wit of Kurt Vonnegut and almost anyone making really entertaining films that don’t rely on a gun to move the story forward. Tames: What has been the most dramatic change in terms of making a film back when you were making Who Killed the Electric Car? and now with Revenge? Paine: Aside from the digitalization of the entire production process, I’d say it’s the changing nature of the audience and distribution of films. Documentaries can reach people in more and more ways even without the theatrical launch we’re lucky enough to have and marketing via social networks (like yours) makes the difference between success and failure. Tames: How did you get started as a filmmaker? Paine: My 4th grade teacher, Mrs. Landreth. “Gold Rush – SUtters Mill” class movie. Super 8. Hooked me. Tames: That’s amazing, for me it was my 5th grade teacher, Miss Beachum, we made a film in class about the American Revolutionary War, Super 8, that hooked me too! So what happened as far as filmmaking after 4th grade? Paine: My friend Roger (a producer on both Who Killed the Electric Car? and Revenge), and I made short films in high school and then in college I spent a summer at Stanford University’s documentary program. That led to a semester at NYU and a summer job at AFI. I had a turn with an MTV pilot series the wake of the Velvet Revolution and several other TV jobs So a bit here and there leading to an assistant job for Michael Tolkin (The Player, The New Age) who impressed me with his brilliance. If I was going to stay in LA, I had to work for someone really smart. Eventually one of my old friends the UK pulled me into his documentaries, and somewhere in there, I decided to try my hand directing a feature documentary. 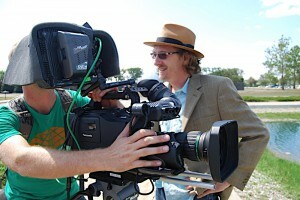 Tames: What advice would you like to share with the next generation of documentary filmmakers? Paine: Find amazing people, build trust, let them tell their stories without interrupting, ask hard questions, listen. Tames: The film is now showing in theaters. What are your hopes for the film from this point forward? Paine: That more and more people hear about it and see it and get inspired. For me it’s much more than a film – though my job as story teller is first. Tames: Filmmakers always have to kill some of their darlings, is there something you left out of the film you wish you could have covered? Paine: One of the biggest users of electricity in the country is the oil industry – simply to refine gasoline from crude oil. Wish I could have fit that story into this film. Maybe the next one. All we need to do is put that electricity directly into our cars and bypass the oil. Tames: Sounds like we have a lot to think about. It’s been a pleasure talking with you today. Paine: Thanks for doing this! See this film! It’s a very uplifting historical depiction of what has happened in the past several years in the EV world. From the attempt to kill this important technology, to the clear understanding that electricity is the end game for powering our cars, “Revenge” documents it all with the visionary people who are putting their money and companies on the line to make it happen.